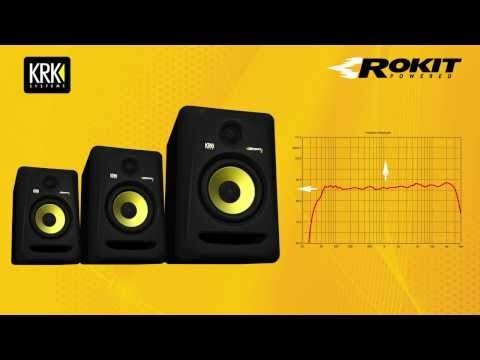 KRK's immensely popular Rokit studio monitors have evolved and the next generation in the series has finally arrived, in the form of the KRK Rokit G3 monitor speakers. The Rokit G3 speakers deliver a level of precision and performance unheard of from monitors in this class. These powered monitors include several key design elements that are found in KRK's premium models. Don't be fooled by the price because in terms of excellent sound quality and attention to detail, they pack a punch! Utilising their wealth of knowledge and experience to improve the existing performance, KRK has created monitors that deliver a natural and balanced spectral response with low distortion and exquisite sound imaging. You won't find any added bass or treble, or experience a swept out mid-range. This means that the sound you hear from the speakers is as honest as it can be, whilst retaining its musicality. To ensure an accurate and tight bass response is delivered, the glass-aramid composite woofer, cabinet and port have all been fine-tuned to the most minute possible degree. A specifically designed 1" silk dome tweeter is employed for the role of handling the upper-frequency response. It does the job efficiently, with grace and clarity, offering an extended response up to a jaw-dropping 35kHz. The KRK Rokit RP8 G3 speakers adore a challenge and can easily handle low to incredibly high sound pressure levels (SPLs) without any unwanted distortion creeping in or out. This is because precision engineered limiters work with each internal amplifier to guarantee a clean, distortion-free sound and truly balanced response. Each Rokit G3 speaker is designed to guarantee that once you find the "sweet spot" in your speaker placement, even if you turn off-axis, the overall sound image remains consistent so you don't suddenly lose the left or right side of a stereo mix. Therefore, instead of remaining rigidly fixed during mixdowns, you a free to move about freely whilst you work. As well as this, the angled design of the speaker cabinet means that diffraction is significantly reduced. Low and high-frequency adjustment controls on the reverse of each speaker allows you to attenuate their response to your own personal taste. The same control also adjusts itself in response to the acoustics of the room it is in. There are multiple connections out of each speaker (i.e. XLR, 1/4" and RCA) as well as a Master Volume Level control. They even have a highly useful auto-standby function so you needn't worry if you leave them switched on. Posted on 23/07/2015 by Jhaze Amazing looking speakers, great sound and easy to understand interface.